President Donald Trump spoke publicly about embattled Alabama Republican Senate candidate Roy Moore for the first time Tuesday, saying of the multiple allegations of sexual misconduct against him: "You have to listen to him also" and "He totally denies it." Add Roy Moore as an interest to stay up to date on the latest Roy Moore news, video, and analysis from ABC News. Speaking to reporters on the White House South Lawn before leaving Washington to travel to Florida for the Thanksgiving holiday, Trump stopped short of fully endorsing Moore — whose candidacy and two stints as Alabama chief justice attracted controversy even before the sexual impropriety allegations — but attacked Moore's Democratic opponent, Doug Jones. "We don't need a liberal person in there," said Trump. "Jones — I've looked at his record, it's terrible on crime. It's terrible on the border. It's terrible on the military." The White House earlier said that Trump believes that "the people of Alabama should make the decision on who their senator should be" but added that "if the allegations are true," he believes Moore would step aside. Trump called attention to the position Moore has taken since the accusations emerged two weeks ago. "Let me just tell you, Roy Moore denies it. That's all I can say. He denies it. By the way, he totally denies it," Trump said. He teased that he will let reporters know "next week" whether he will campaign for Moore. Asked if he had a message for women as he addressed the accusations, Trump called it "a very special time because a lot of things are coming out," referring to the numerous public figures who have been accused of sexual misconduct over the past several weeks. Former Alabama Chief Justice and U.S. Senate candidate Roy Moore waits to speak the Vestavia Hills Public library, Nov. 11, 2017, in Birmingham, Ala.
"I think it's very, very good for women," he said. "And I'm very happy a lot of these things are coming out. I'm very happy it's being exposed." Moore again denied the allegations against him Tuesday night in an interview on the Alabama Cable Network, saying, "I never dated underage women and I never engaged in sexual misconduct with anybody. I mean, you have to understand, I was deputy district attorney, then a circuit judge. I go by the law." The candidate, who held a press conference to refute allegations Tuesday afternoon, also said further proof of his innocence would be coming soon. "It takes time to develop a case and file a case because you just don't go file a case without some proof," Moore said. "And we're getting proof, we're getting things. In fact today we had a conference, press conference, where a lot of this was brought out. And we'll continue to do that. And there are things coming out in the future that I can’t talk about." The allegations against Moore began with the publication of a Washington Post report on Nov. 9, in which it was claimed he made sexual advances on a 14-year-old girl in the late 1970s. 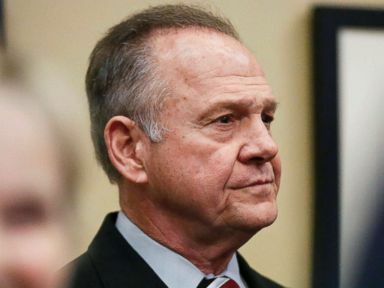 Moore has since been accused of sexual misconduct by additional women and has had several prominent members of his party call for him to withdraw from the Senate race. Moore has denied all the allegations against him. Trump was accused of sexual misconduct by more than a dozen women during last year's presidential campaign, claims he has denied. On the allegations facing Sen. Al Franken, D-Minn., and Rep. John Conyers, D-Mich., Trump said he only recently learned about the ones against Conyers and, on Franken, said he would let the senator "speak for himself." Conyers said in a statement Tuesday that he "expressly and vehemently" denies a report that he harassed a female aide and that the accusation was resolved with an "express denial of liability."